The undoing of Charles Freeman, who had been nominated as the next chairman of the US National Intelligence Council, is continuing to draw a barrage of reactions from a surprisingly diverse range of corners. Chinese dissidents, former American ambassadors and intelligence officials have all weighed in, as the debate continues over whether Mr Freeman was brought down by his views on Israel. An outspoken former ambassador to Riyadh, Mr Freeman found himself at the centre of a growing controversy about his views on Israel, China and Tibet while the campaign against him, first online and then on Capitol Hill kept growing. On Tuesday, 10 March, his soon-to-be boss, Dennis Blair, defended his choice in Congress. Later that afternoon, Mr Blair's office sent out a note announcing that Mr Freeman was withdrawing his nomination. Mr Freeman sent out an acerbic letter, accusing the "Israel Lobby" of "plumbing the depths of dishonour and indecency", using "character assassination" and controlling policy by vetoing people who disagreed with them. In an interview with the BBC, Mr Freeman then said he regretted the use of the words "Israel Lobby" saying the campaign had been waged by specific groups aligned with rightwing factions in Israel which he described as the "Likud or (Avigdor) Lieberman lobby". But he stood by his accusations about a campaign waged against him, saying it was a transparent one for which the Zionist Organisation of America had openly claimed credit. ZOA's president Morton Klein told the BBC it was "nonsense, rubbish to say all the pro-Israel organisations were making an issue about him". "We were the only ones on Capitol Hill raising concerns about him," he said. Mr Freeman added he felt "deeply insulted having been attacked for representing foreign interests by someone who is himself under indictment for espionage for a foreign government". One of those leading the campaign against Mr Freeman online had been Steve Rosen, a former official from the powerful pro-Israel lobby Aipac who was indicted in the US in 2005, along with a colleague, for violating the Espionage Act by "giving national security information to persons not entitled to receive it". Mr Freeman's letter was pounced on by his critics, and others, who said it proved their point. In its editorial following his withdrawal, the Washington Post described it as "grotesque libel". Republican congressman Frank Wolfe also wrote in the Post on Saturday that "while the reports of Freeman's public statements first raised my concern about his suitability to be chairman of the National Intelligence Council, his words after his withdrawal crystallised exactly why Freeman was the wrong choice for the job". Few people dispute that pro-Israel lobbyists were the driving force in the campaign against Mr Freeman, but some observers believe that if his views on Israel had been the only controversial thing about him, it would not have been enough to bring him down. Mr Wolfe wrote that he had not been contacted by any pro-Israel lobby group and that his concerns were mainly about Mr Freeman's views on China and Tibet and his ties to foreign governments. Mr Freeman served on the advisory board of the state-owned China National Offshore Oil Corp (CNOOC) for which he was paid $10,000 a year. He was also the president of the Middle East Policy Council, which received funding from Saudi Arabia. He resigned from the positions before accepting the nomination for the NIC job and says there was nothing improper about either position. 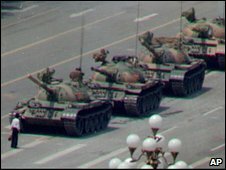 But in an e-mail he sent a few years ago and which has become public, Mr Freeman said that he found plausible "the dominant view in China" which stated that the real mistake of the authorities was not the crackdown on protestors on Tiananmen Square in 1989 but the fact they had not nipped the demonstrations in the bud. He goes on to say that no government would allow the heart of its capital to be occupied by dissidents and ends his mail by stating "I thus share the hope of the majority in China that no Chinese government will repeat the mistakes of Zhao Ziyang's dilatory tactics of appeasement in dealing with domestic protesters in China." The comments are read widely as justification of the Chinese government's action but Mr Freeman insisted he was reading facts and predicting outcomes, adding that empathy is key to analysis. "I'm not justifying, I'm describing it. There's a difference between analysis and policy. Analysis is an effort to understand the facts and the motivations of those who are creating the facts, Chinese demonstrators or leaders, and then explain that to those who must make decisions about what to do about it." His comments on Tibet also drew fire from speaker of the House Nancy Pelosi, who reportedly described them as "indefensible". In 2007, Mr Freeman had said that the American and European posturing on the issue of Tibet would lead to a long term clampdown by the Chinese. He said he didn't mean to say that the West should stay quiet but that it should expect a Chinese reaction. The way Mr Freeman's expresses his views led to criticism that he was an ultra-realist, unconcerned about human rights. "Freeman belongs to the camp that's the mortal enemy of the neoconservatives: the realists. Realist ideology pays no attention to moral differences between states," wrote Jonathan Chait, editor of The New Republic. "(They) are the mirror image of neoconservatives in that they are completely blind to the moral dimensions of international politics." Mr Freeman said he took it as a compliment. "It is an extraordinary accusation to accuse someone whose job is analysis of the sin of objectivity. If you already know what the answer ought to be and then voice it, why go through the pretence of analysis at all," said Mr Freeman. "The notion that somehow analysis should bend itself to what is politically expedient is precisely the issue we need to crack." The episode has indeed raised some concern inside the intelligence community. 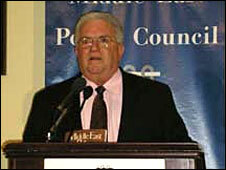 In an article for Foreign Policy, entitled How to Discourage the Speaking of Truth to Power, former CIA officer Paul Pillar wrote that he remained convinced that "enforcement of political orthodoxy about US policy towards Israel" was at the heart of the affair and the message to intelligence officers was clear - "their work will be acceptable only if it conforms to dominant policy views". Mr Pillar ends by saying that the next time the intelligence community fails in its job, the way it did on Iraq's WMD's, people in Congress and elsewhere should ask themselves "how they could expect intelligence officers to show superlative courage in bucking political orthodoxy when they showed so little themselves". In his letter, Mr Freeman also said the affair "will be seen by many to raise serious questions about whether the Obama administration will be able to make its own decisions about the Middle East and related issues". But a DC-based advocate on Arab issues said that people like him and others working on Arab and Palestinian issues should learn from the episode and maintain a pragmatic attitude. "Freeman was very vocal and very strident about Israel, he really identified with the Palestinians and Arabs in particular. For him it was a case of- support the Palestinians and stand against the Israelis," said the advocate who wished to remain anonymous because of the sensitivity of the issue. "But if you approach it like that, as a zero sum game, the zero will always be for us (Arabs), we cannot win. If we want to make progress, we have to be pragmatic." He added that people should not conclude that "they should self-censor on the issue of Israel. What matters is how you criticise and what are your other alignments and associations. It's a good lesson."